We are conducting observational tests to prepare for a new, high-accuracy imaging polarimeter, WALOP (Wide-Angle Linear Optical Polarimeter). WALOP will be used to survey a large portion of the high latitude sky in optical polarization. You may read more about the survey (PASIPHAE: Polar-Area Stellar Imaging Polarization High-Accuracy Experiment) at pasiphae.science. PASIPHAE's goal is to combine stellar polarization with distances from Gaia, to get a 3D view of the magnetic field in the diffuse ISM. We have demonstrated the potential of such a survey to tomographically map the magnetic field using data from the RoboPol polarimeter (RoboPol instrument paper). The ISM contains clouds, mainly made up of molecular hydrogen, that are the sites where stars form. The details of this formation process are a subject of active academic research. One aspect of this process is the influence of the magnetic field on the structure and evolution of these clouds. I study this by measuring the polarization of starlight, which reveals the orientation of the magnetic field in molecular clouds. With enough measurements, one can construct a map of the magnetic field as seen on the plane of the sky. Figure 1 shows a map of the magnetic field orientation (red lines) in the Polaris Flare molecular cloud, made using the RoboPol polarimeter at the Skinakas observatory in Greece. The magnetic field structure can be compared to the intricate filamentary morphology of the cloud, seen through the Herschel space telescope in the far infrared, to learn about the influence of the magnetic field on cloud structure. The Polaris Flare polarization data are publicly available. Figure 1: Optical polarization segments from RoboPol overlaid on the Polaris Flare dust emission image (Herschel @ 250 microns). Through observations of the emission from dust in molecular clouds, the Herschel Space Telescope revealed that cloud material is organized in a network of filamentary structures. The properties of these structures are very interesting, as they can help us understand how they form and evolve. Another interesting aspect of the process leading to star formation is the manner in which gas moves inside a cloud, a motion that is highly complex (turbulent). One can use emission line data from molecules like CO, which exist in minuscule fractions in molecular clouds, to trace one of the 3 components of the gas velocity, the component that lies along the line of sight. 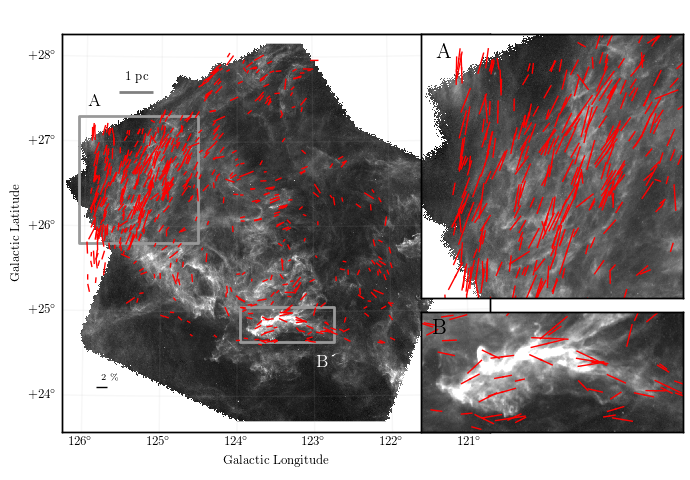 I have used such radio data from the NRAO taken in the region of the Taurus molecular cloud, to study the kinematics of filamentary structures. I developed FilTER, a code for extracting the properties of these filaments. I am part of the RoboPol collaboration, whose main goal is to characterize the polarimetric properties of blazars - energetic distant galaxies with central black-hole jets that are aligned with our line-of-sight. The goal of this study is to understand the mechanisms through which the relativistic jets of blazars are launched and accelerate particles, through the statistical characterization of a phenomenon that appears in their optical polarization properties, namely, polarization angle rotations. These changes in the polarization angle can reveal information about the magnetic field structure in the jet and the way that disturbances propagate along the jet. Read more about the project at robopol.org. A list of related publications can be found on the NASA ADS webpage at this location.